Goodreads: The only legitimate child of Lord Byron, the most brilliant, revered, and scandalous of the Romantic poets, Ada was destined for fame long before her birth. Estranged from Ada’s father, who was infamously “mad, bad, and dangerous to know,” Ada’s mathematician mother is determined to save her only child from her perilous Byron heritage. Banishing fairy tales and make-believe from the nursery, Ada’s mother provides her daughter with a rigorous education grounded in mathematics and science. Any troubling spark of imagination—or worse yet, passion or poetry—is promptly extinguished. Or so her mother believes. 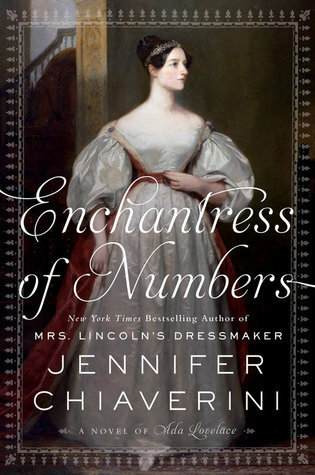 Kritters Thoughts: Jennifer Chiaverini is known in the historical fiction world. For me she has written some really great books that have a foot in historical fact, but have a bit of fiction added to make it a good story! This one had a bumpy start for me. With the prologue being quite lengthy and concerning how Lord and Lady Byron met and "fell in love" and how Ada was conceived, I from the start HATED Lord Byron and was nervous that I would not enjoy this one. As soon as Ada is given the reigns of the story and narrates her own childhood I was ready for a good book. Somewhere in the middle of the book, this one took a dip for me and just dragged along. I felt like once Ada took the reigns we were going a good 50 mph and then somewhere in the middle it hit a speed bump and went slow and slower and I couldn't get my attention to keep on it. As soon as Ada met Mr. Baggage it got better, but it never picked up and really worked for me. This lackluster read wouldn't keep me from reading more by Jennifer Chiaverini, but I have to say I like her American history books more than this one abroad.